The return to school can be a hectic time for students and parents alike. Schedule changes, fall sports, new clothes, and school supplies are on everyone's mind. A conversation about the important need for school supplies gave District 9's Community Relations Coordinator Tara Callahan Henry an idea. Realizing that not every family had the means to fulfill the long supply lists sent home by schools, she and her colleagues came up with a plan to help to help local elementary schools. Callahan Henry and her team brainstormed the idea to use the iconic and often-dubbed "state flower of Pennsylvania" for something positive, and "Stuff the Barrel" was born. Once a list of supplies deemed most important was devised, it was decided to take it one step further by reaching out to local engineering firms and businesses to see if they wanted to partner with District 9. 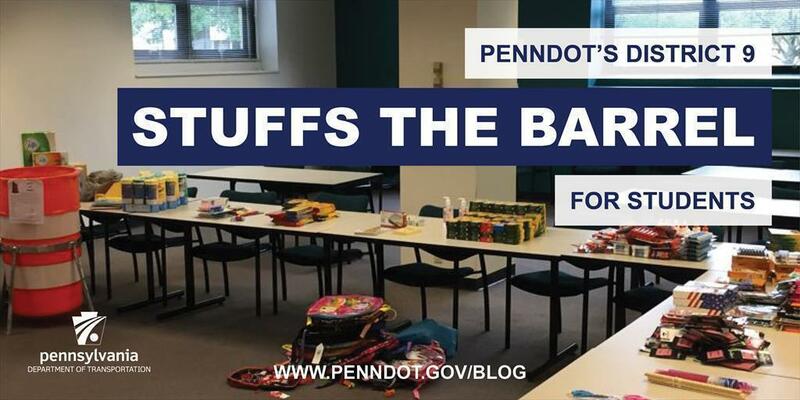 For more than four years, a group of consultants and PennDOT District 9 have worked together on a local food drive called "Engineers CAN Fight Hunger," so we reached out to them to see if anyone had an interest in working with us on this new project. The EADS Group, Stiffler McGraw, and Keller Engineers all decided to participate with us. Supplies were collected for approximately three weeks. Not only were donations received from PennDOT staff and the engineering firms, but we also received a generous donation of MEAD notebooks and supplies from ACCO, Inc., in Huntingdon County, as well as numerous donations from the public. The team analyzed data from all the elementary schools in the District 9 region and chose four schools based upon the highest number of students receiving free lunches and those with the most families below poverty level.